The best, healthy ingredients from the earth are mixed into a delicious daily meal. Multiple proteins including pork meal, beef and lamb, plus dried blueberries, flavorful rosemary, sage and thyme. No corn, wheat, soy, poultry by-products. Made in the USA, where ingredients meet the highest quality standards. Pork Meal, Dried Potatoes, Peas, Sweet Potatoes, Pork Fat (Preserved with Mixed Tocopherols), Natural Pork Flavor, Pork, Beef, Lamb, Yeast Culture, Organic Alfalfa Meal, Salt, Salmon Oil, Vitamins (Vitamin E Supplement, Vitamin A Acetate, Vitamin B12 Supplement, D-Calcium Pantothenate, Vitamin D3 Supplement, Niacin, Riboflavin Supplement, Biotin, Pyridoxine Hydrochloride, Folic Acid, Thiamin Mononitrate), Minerals (Zinc Sulfate, Iron Amino Acid Complex, Zinc Amino Acid Complex, Manganese Amino Acid Complex, Copper Amino Acid Complex, Potassium Iodide, Cobalt Amino Acid Complex, Sodium Selenite), Dried Blueberries, Choline Chloride, Cinnamon, Rosemary, Sage, Thyme, Yucca Schidigera Extract, Dried Lactobacillus Plantarum Fermentation Product, Dried Lactobacillus Casei Fermentation Product, Dried Enterococcus Faecium Fermentation Product, Dried Lactobacillus Acidophilus Fermentation Product. 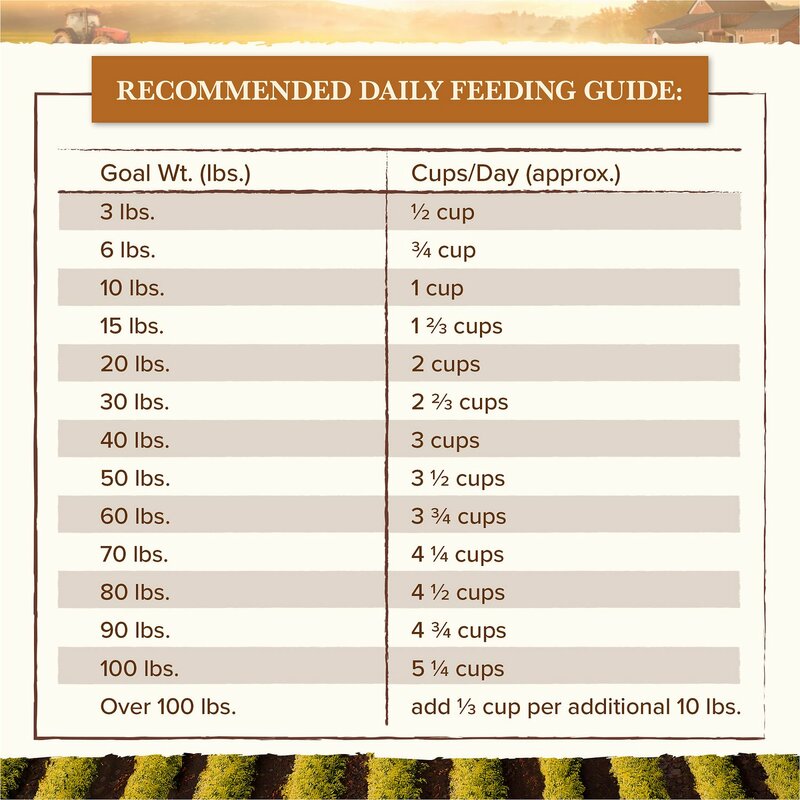 For dogs over 100 lbs, add 1/2 cup of dry dog food for each additional 10 lbs. Adjust feeding level to your dog’s individual needs. Puppies and pregnant or nursing females may consume 2 or 3 times the recommended amount per day. Keep fresh water available at all times. 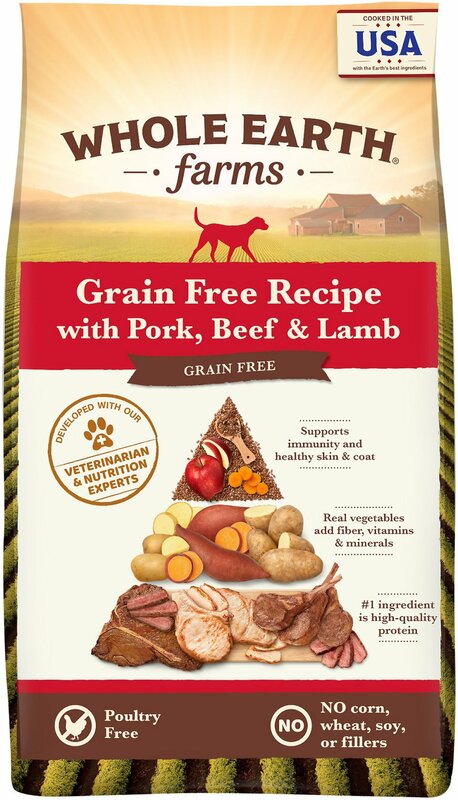 This is the #1 grain-free brand for our dog and cats!! 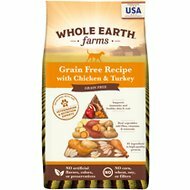 We had been using Whole Earth Farms grain free cat food for years with great results, so when we adopted our new dog this brand was our first choice. Happy to report that the dog food is excellent too! Our sweet dog Cedar was an underweight, malnourished stray who had trouble eating consistently at the shelter. He quickly took to this food in his new home and is looking better everyday :) Great food at a great price!! My 20# dog loves this food, and I can even use it as treats. Dealing with food allergies, I had been feeding him a poultry-based, grain-free food. It was a good food, but eventually he began licking his feet, and tiny bumps developed on his skin. Not fond of using allergy medications, I opted to try a different food. I was happy to find this red meat based, grain-free, poultry-free formula! After a month of buying several small bags of this food, his allergic symptoms had cleared up, and then I ordered the large bag. So far, so good. The important thing is, Whole Earth Farms is a highly reputable brand and has a variety of formulas available for many dogs' different needs. Allergy & picky pup approved! My 3yr old Pittie is a dork and picky about food. She loves this food and she is so excited to eat, which she wasnt with her old food. She cannot have chicken and it's so hard finding formulas without chicken meal, even if it says lamb or beef! So I gave this a shot. She is only 45lb and a delicate girl, so the size of the kibble is a little big for her. The size of the kibble is my only complaint. Other than that she seems very healthy and very excited to eat. I love how this is owned by Merrick but without the steep price. Hmm.. Kind of smells funny. 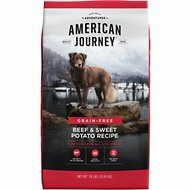 My 5 year old Aussie will eat anything but not this stuff. He loves the regular Whole Earth Farms adult recipe. It smells a little funny compared to the adult recipe as well. I will try the two other flavors. I looked hard and long for a grain free dry dog food for my 3 pups. They are small dogs and they were tired of the usual stuff. I get it...kibble can get boring. They gobble it right up and I don't have to stand guard for the slow eater to finish. I love this brand and switched to it when i researched about it. It is made by Merrick. But it is cheaper than the bags that actually say Merrick on them. I learned all their ingredients are from U.S.A as well as completely made in U.S.A. ,,in Texas. No guessing if processed in a mysterious country, or if the ingredients are from a mysterious country. I trust it and there's hardly any fillers in the ingredients which means less waste to pick up!!! The kind i get has fish oil in it so their coats are shiney and yet the food does not smell like fish. A plus for me too. It is a grain free, healthy food made by an established dog food company. The price is very reasonable. My GSD loved it and lived for 14 years.